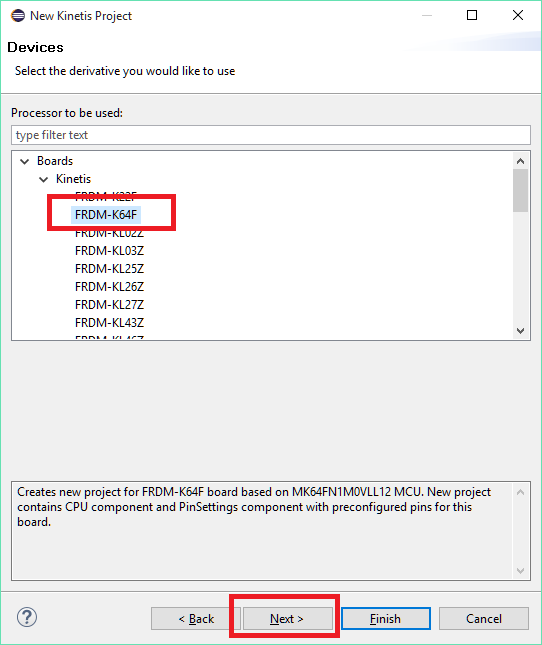 Previously I created a blog post on Printf to UART using Processor Expert, this is a great way to output debug info at runtime to a console using the OpenSDA USB debugger port as found for example on the FRDM K64F board. What if you don’t want to use this USB port or can’t because you don’t have one, for instance on a custom board perhaps. 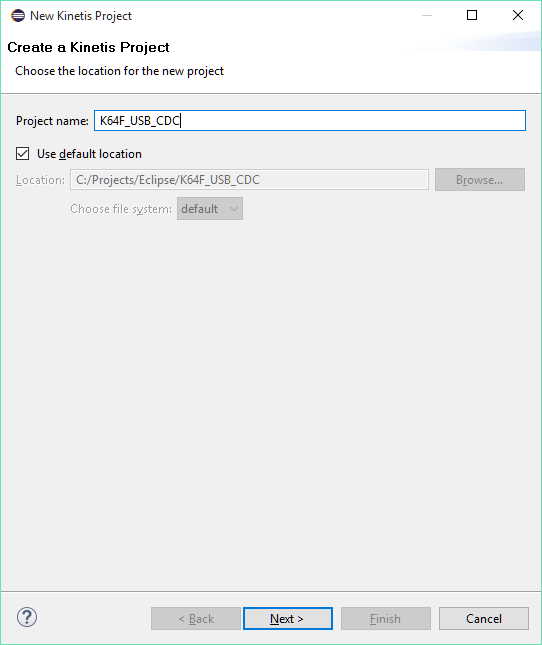 Well if your board provides a USB port that connects direct to the mpu’s USB pins this blog will help you configure all the Processor Expert components and code needed to output to that type of USB port. In this blog I will again use the FRDM K64F board but it has a second USB port that is directly connected to the USB pins of the of the MK64FN1M0VLL12 MCU. 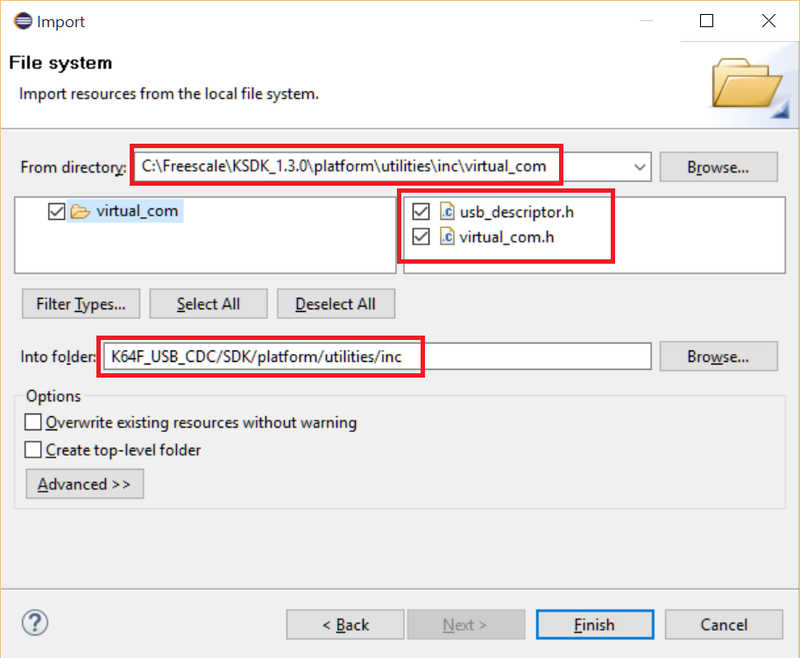 I am using KSDK 1.3.0 and Eclipse Neon but I will also try provide notes on how to do this in KSDK 1.2.0, if you want to know how to set up Eclipse you can follow the directions on my blog Toolchain: KSDK 1.2.0 with Eclipse 4.4 (Luna) and GNU ARM Plugin, although that blog covers an older version of Eclipse and KSDK, the steps work perfectly still as long as you download all the latest pieces of software mentioned in that blog. PLEASE NOTE: I am not an expert with USB on Kinetis devices so I cannot provide any help on any other USB related projects such as Mass storage devices or HID devices. 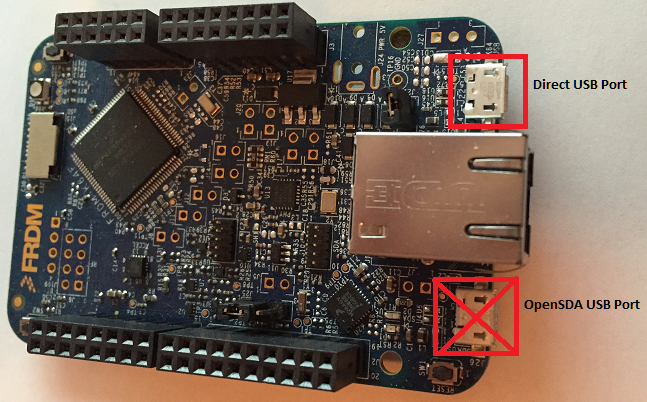 Please do not post comments/questions asking how to perform other types of USB projects. Ok to start, create a new Kinetis project. Select the board type. In my case I select the FRDM-K64F board. Select KSDK_1.3.0, Processor Expert and standalone. Select “GNU C Compiler” and click Finish. 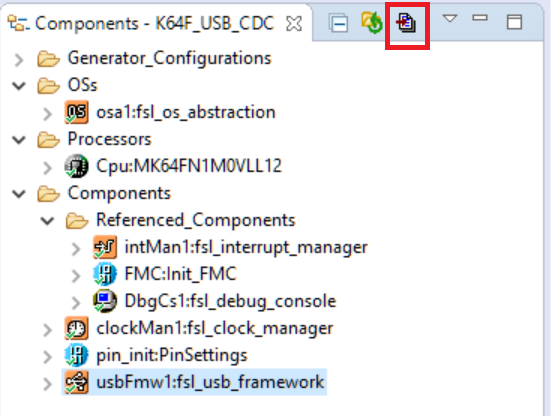 Switch to Processor Expert perspective and add the component “fsl_usb_framework”. 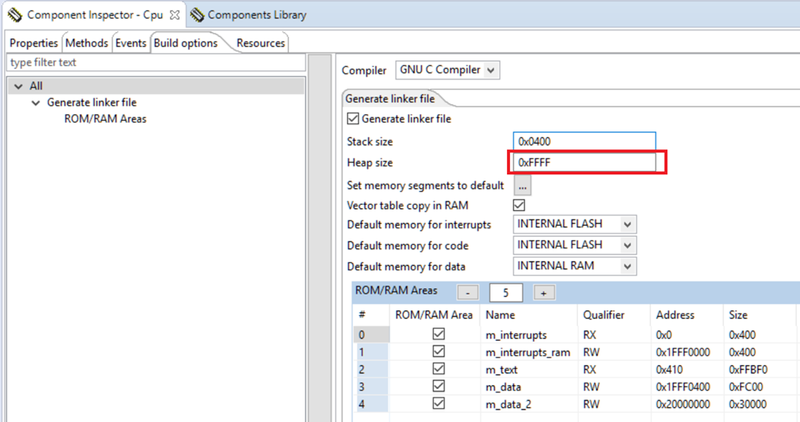 Note this will also automatically add the referenced components “Init_FMC” and “fsl_debug_console”. 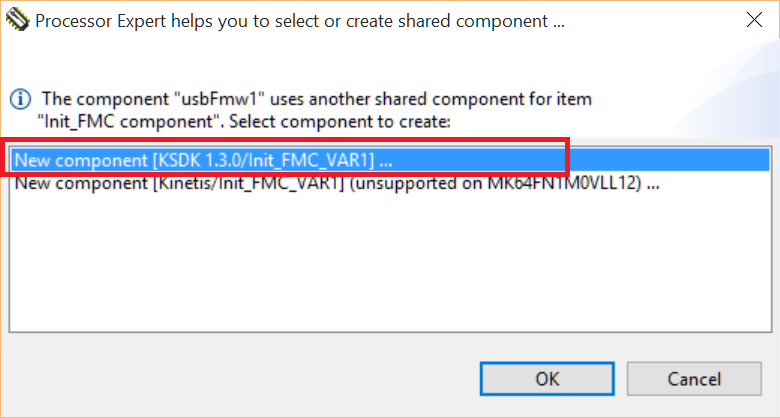 Note: In KSDK 1.2.0 the “Init_FMC” is not automatically added for you but you still add it manually then afterwards. On the Components window select “usbFmw1:usb_framework” and set the properties as below. Its important that the USB clock is set to 48 MHz. Its also very important that MPU is disabled as the MPU protects the Bus from USB read/writes. 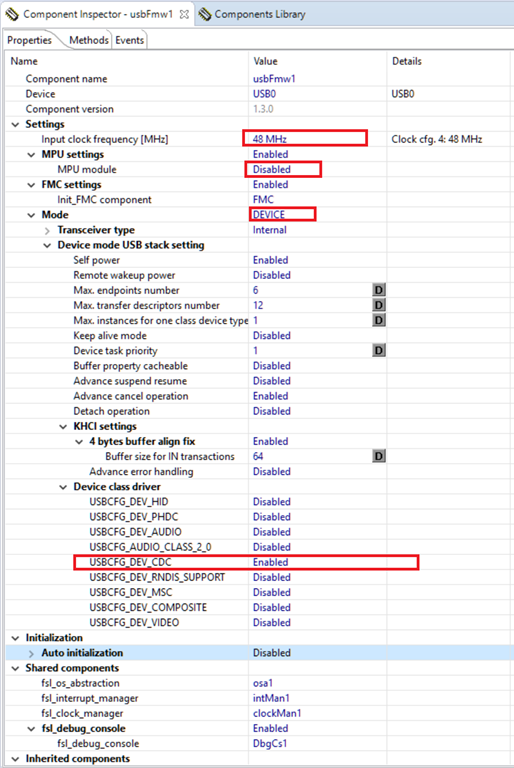 Make sure the Mode is set to “DEVICE” then Enable “USBCFG_DEV_CDC” under the Device class driver section. 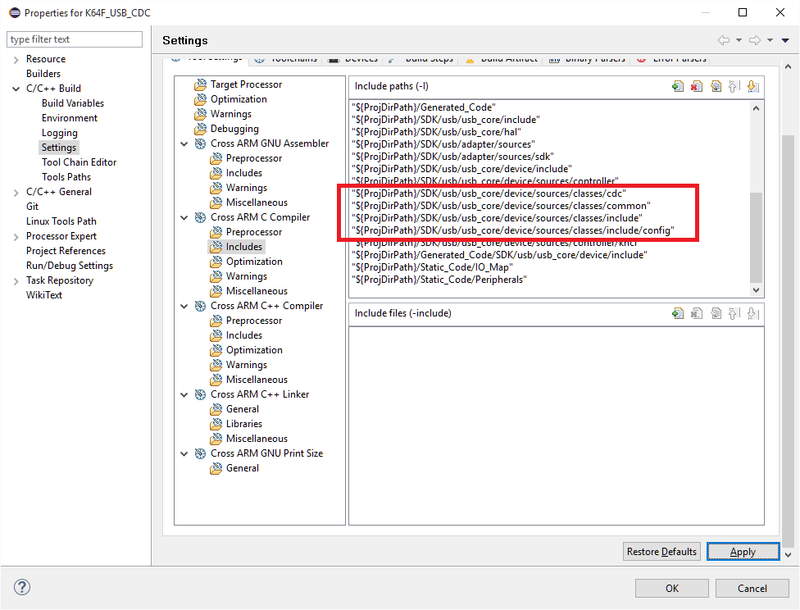 Note: In KSDK 1.2.0 the option to disable the MPU is not available on this component, you will need to manually add the component “Init_MPU” and disable it from there. 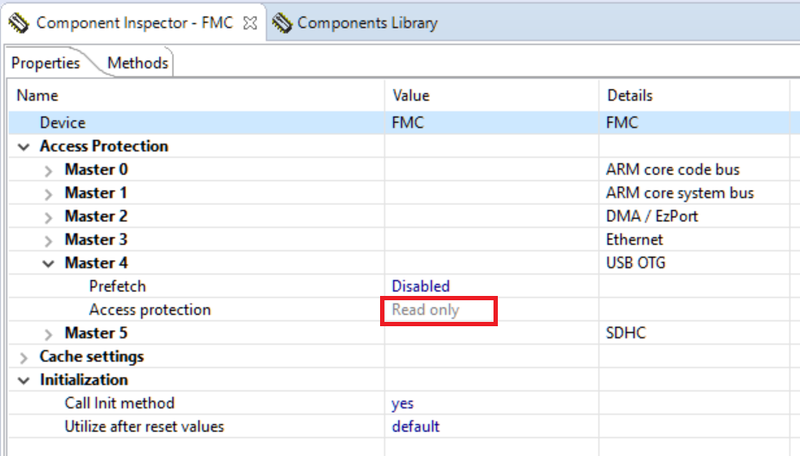 Now select the component “FMC:Init_FMC”, this should be already set correctly for us but just note that the important bit here is that the access protection on Master 4 which protects USB memory access areas must be set to “Read only”. Note: in KSDK 1.2.0 this is not set for you, you must manually set Master 4 to Read only. 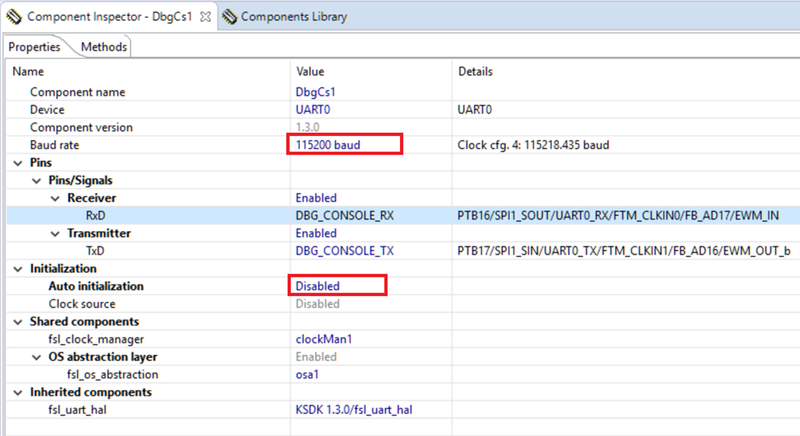 Next select the “DbgCs1:fsl_debug_console” component, make sure the “Baud rate” is set to 115,200. It’s not important what Pins the Receiver and Transmitter are set to as this will get overridden in code when we initialise this component manually. VERY IMPORTANT, make sure the “Auto initialization” is disabled, as said, we will manually do this in code. Ok one last configuration then, select the “Cpu:MK64FN1MOVLL12” component (or whatever MPU you are using). Switch to the “Build Options” tab and make sure you set a Heap size because usb stack uses malloc which uses a function called _sbrk(). This function checks if there is heap memory available to allocate to the malloc. The FRDM K64F board has enough memory available for me to set the Heap size to its max on this screen of 0xFFFF, Also make sure you have at least 0x400 allocated to the Stack. Note: KSDK 1.2.0 has a bug and does not implement a _sbrk() function, you will need to create your own _sbrk() function to get this to work. See the end of this Blog on how to do this. 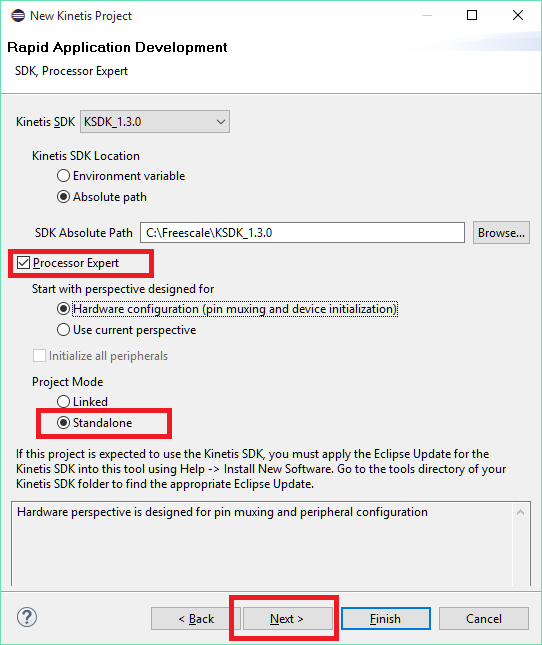 Now generate code from Processor Expert. based on this section of code I can see that the code actually supports using USB and the use of the “VIRTUALCOM”. 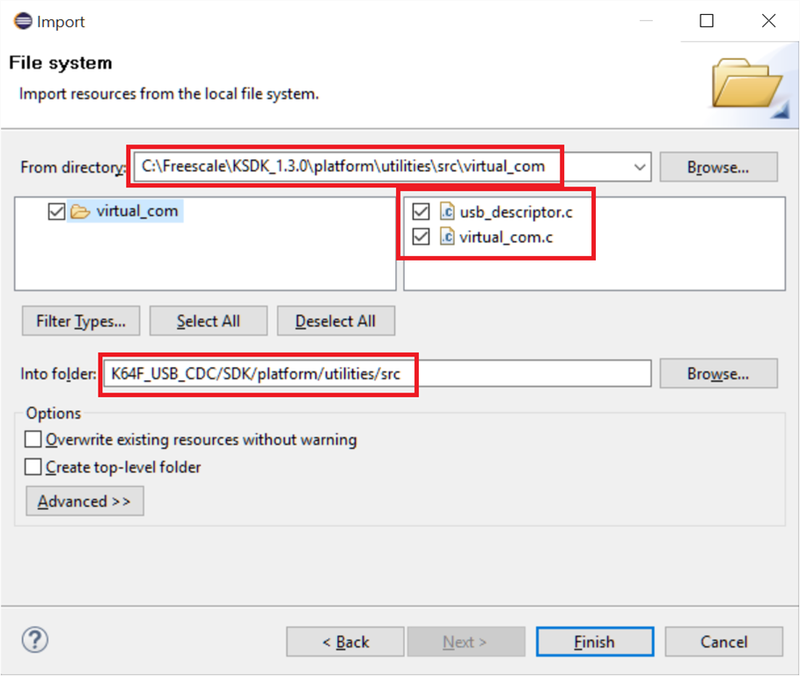 What is this “VIRTUALCOM”, well if you were to look at the code in the example KSDK project “C:\Freescale\KSDK_1.3.0\examples\twrk64f120m\demo_apps\usb\device\cdc\virtual_com\bm\kds” which is a project for demonstrating how to use USB CDC communication but without the use of the” fsl_debug” component or using Processor expert at all, then you will see that the “VIRTUALCOM” is the main piece of code written for sending and receiving messages over the USB CDC. Great, that means then that we can enable the “fsl_debug_console” to make use of it. So looking at this section of code in “fsl_debug_console.c”, it looks like all we need do is define a symbol for “BOARD_USE_VIRTUALCOM”. 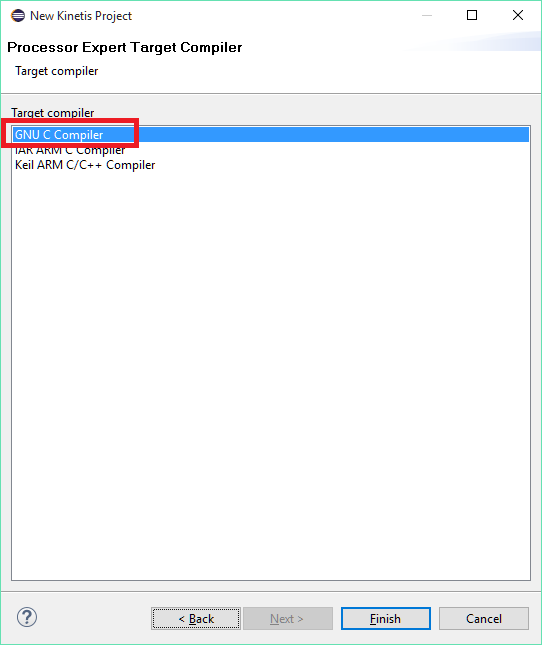 Open up the Properties of the project and under “C/C++ Build >> Settings >> Cross ARM C Compiler >> Preprocessor” add the symbol “BOARD_USE_VIRTUALCOM”. make sure to include the double quotes around the symbol. One last thing to do is make sure we initialise the Debug Console component telling it to use the USB CDC. If you remember we intentionally disabled auto initialising the “fsl_debug_console” in processor expert. This was done for the purpose of providing us the ability to change the device used by the console. So at the start of your main function just after the call to “PE_low_level_init()”, make the call “DbgConsole_Init(BOARD_DEBUG_UART_INSTANCE, DEBUG_UART_BAUD, kDebugConsoleUSBCDC);”. **         This module contains user's application code. **     for the Freescale Kinetis series of microcontrollers. That’s it then, after that you can make “PRINTF”, “SCANF” or “GETCHAR” calls in your code and it will output to the OTG usb port on your board. Please note, you must capitalise the calls to the functions “PRINTF”, “SCANF” or “GETCHAR” as these are specialised versions of the functions that reside inside the “fsl_debug_console.c” file. Good luck, hope this works well for you all. Hi there, I have used your tutorial – an excellent tutorial again – and programmed my custom board. It works like a charm! thanks you very much. Please, keep posting whatever projects you ‘d like to share. I ll definitely follow your website. Really thank you for this tutorial, it was very helpfull for me. I’m working whit the KL27Z256VLH4 and your steps to create this project is working fine on my own board. I have some doubts about the USB CDC communication, at this moment my project works just in some terminals like “Tera Term”, “RealTerm” and “Putty”. I’m my own application builded on C++ Builder from Borland,using the “TComPort” and in the “Termite” by CompuPhase it crash. I don’t know what’s happen, like the diferences between the implementation program of this softwares. Basically on the “Termite” when I send a character, the device crashes, and in my application too. Thank you so much for this article. Keep it available on the web! Also, if you are using windows, open up device manager, look for your CDC device, right click and view port settings there. On my pc I can change the settings for the port I just specified above. 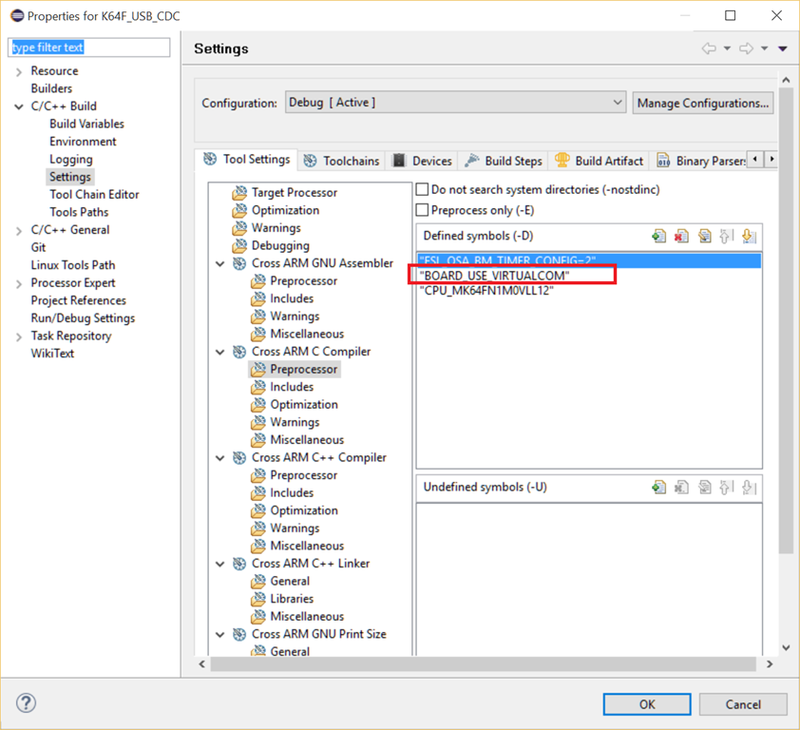 Both the device manager settings for the port and your C++ application must match up on all the port settings. Hi, thanks for this tutorial is has been a huge help for me. Is there an error in section 12? Looking at your project I downloaded the actual path seems to be. Thanks Jim, you are correct. I have updated the blog. I put this blog together in quite a rush as my time is very limited now days. I’m grateful for you pointing this out. Hi, I noticed that SCANF does not echo the characters to the terminal, is that normal behaviour? In terms of what the code is doing yes, but its easy enough to change this. I also had some annoyances with PRINTF and SCANF provided by the Kinetis SDK, namely it blocks on PRINTF until a terminal window is attached, but then it also fails to properly check in the SCANF if a terminal window is attached. All of this can be easily fixed by tweaking the code inside of the virtual_com.c file. Try look at that file for your self and if you don’t come right let me know and I’ll post some more info on exactly where to make the changes. Hi, thanks ever so much for this guide. It was my first affair with USB in more complex devices and your tutorial guided me through all the “minor details” rarely mentioned elsewhere. Just wondered how you solved the blocking issue with the PRINTF, I can see the issue with the VirtualCom_SendDataBlocking function but my attempts at a solution stop the port initialising. great, thanks. All working well now. Excellent tutorial. Helped me a lot in my custom board. Could you provide help in tweaking the code for SCANF? Hi Kiran. Sorry I haven’t been working on this for some time now but from what I remember if PRINTF is working then SCANF should be working as well except I think the first line in the function VirtualCom_SendDataBlocking() in the file \SDK\platform\uilities\src\virtual_com.c might need paying attention to, this function is ultimately the real logic that performs the SCANF. That first line should block the app from proceeding any further until a key is pressed. Just check its logic and make sure its doing what you expect. Another area I think that might cause issues is in the function USB_App_Class_Callback() in that same file. put a break point in this function and debug it to check if it is doing what you expect, I seem to remember having to debug some of the logic there but I can’t remember what it was or why. Sorry I know my answer isn’t directly helpful but its just been so long. I hope I have given some ideas on where to start looking to debug your issue. Thank you for the quick reply. I got it figured out. My USB_CDC project is running well on Kl26Z (64 pin IC package) development board which is having 8Mhz external crystal. I have similar set-up on custom board with Kl26Z (48 pin IC package) and 16mhz crystal. and my example code is not running. I am unable to debug where I am making mistake. Can anybody help me? Do you have any suggestions on how to get this working with the FreeRTOS component? 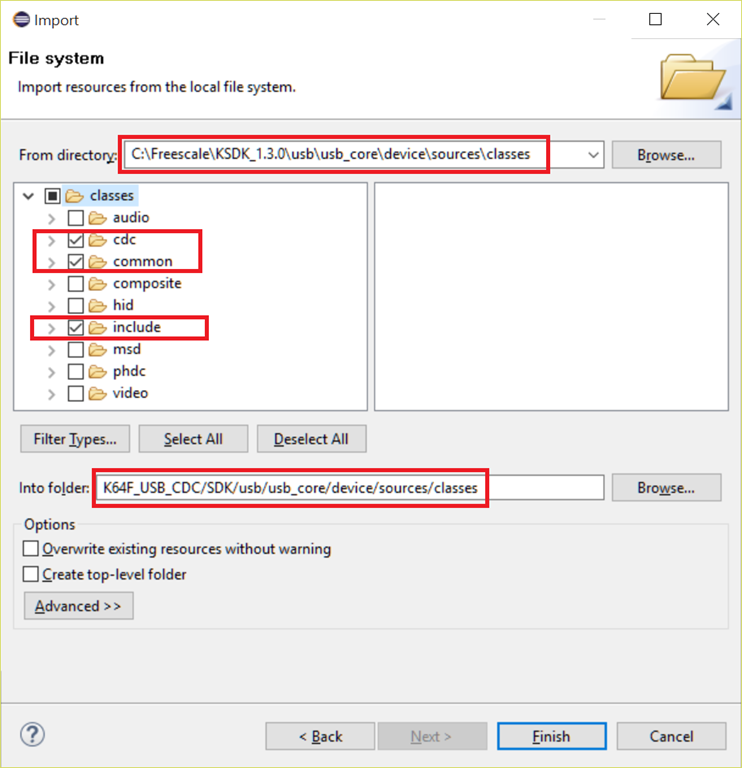 I’m having problems getting the USB identified properly by the PC when I incorporate the FreeRTOS. Unfortunately I have not had this problem myself. I had no real issues using this with FreeRTOS, all I can suggest is to double check all your configurations again. Sorry I can’t help. Has anyone else found a way around the problem of the comms not working again after the usb cable has been disconnected and reconnected? I tried using a timeout to run virtualCom_Deinit() and then virtualCom_Init() but to no avail.